To compare CMock and FFF, I created an example software module (the event_processor) to build some unit tests for. The event_processor interacts with a display module, which is the interface that is mocked during the tests. Note that a mocking framework is nothing without a unit test framework (i.e. some "test" or "assert" functions to use in our tests). In the CMock tests, I use Unity as the unit test framework. To preserve consistency in the FFF tests, I've created a simple unit test framework of my own, with a TEST_ASSERT_EQUAL() macro identical to the one provided by Unity. It's loosely based on MinUnit. I did not find it possible to configure CMock to use it on it's own. What little documentation there is was no help. So instead for these examples I used CMock in a Ceedling project. Ceedling just makes it a whole lot easier to autogenerate the mocks needed for each test. FFF is very simple to set up. It comes as a single header file (fff.h) which you can drop right into your source folder. Then you just #include "fff.h" and you're ready to start using it in you tests. One note: I did need to #include <string.h> ahead of the include for fff.h to get it to build. Looks like FFF is missing an include. You create a fake function by using either the FAKE_VOID_FUNC() or FAKE_VALUE_FUNC() macro. These macros take the function name, arguments and return value (if applicable) as arguments. There are also two other important FFF macros to be aware of. RESET_FAKE() is used clear the internal stats for each fake function. FFF_RESET_HISTORY() resets the call history for all fake function calls. Typically, both of these would be called before each test. These calls are left out of the examples below for clarity, but are done in the "set up" function of the test framework... before each test is executed. Now lets look at a few different examples of how to use each framework. A lot of times, all I want to do is verify that a particular function was called. With CMock, I set up the "call chain" before calling the function under test. CMock itself verifies that everything listed in the call chain is called correctly. Note that this usually means reversing the order of the "then" and the "when" in my test. With FFF, each "fake function" behaves more like a traditional mock object. I create the mock, call the function under test, and then I can inspect the mock after-the-fact. I use the unit test framework to make sure it was called the correct number of times. This lets me write the test in the logical given-when-then order that things actually occur. Another issue here is when an expectation fails with CMock, the line number reported is the line number of the start of the test function... which is not very much help. When you use the unit framework to inspect the mock (as with FFF), any failures yields the real line number at which the failure occurred. // NOTE: We have to ignore a function we know could be called. CMock requires that every expected function call appears in the call chain. Even if we don't care when or how often a particular function is called, we need to "ignore" it explicitly. If we're not careful, this can lead to long chains of expectations. With FFF, calls are ignored by default. As long as we've created a fake function, we don't need to tell FFF what we're expecting. We can control what to test for ourselves after running the function under test. I think this is the single biggest benefit of using FFF. By only looking at the interactions that we actually care about, it becomes possible to write simpler (and less fragile) tests. The FFF version includes one extra line because the function call count is tested independently from the expected value. The CMock syntax here is a bit nicer, but I'd argue that we don't want to make tests like this (with long call chains) easier to write. This is the slippery slope to brittle and un-maintainable tests. Both tests are pretty simple, although the FFF test can be written in the correct "given-when-then" order. CMock starts to get a little hairy in this test. Writing this test requires a lot of knowledge of the CMock API. With FFF, you do a little more work in the test, but it's just C so you already know how to do it. When writing the CMock version, I had to refer back to the documentation a few times, but with FFF, I got it working on the first try. // A mock function for capturing the callback handler function pointer. In this case, both CMock and FFF work similarly. You register your own function to be called when the mock is called, and set up your function to capture the provided function pointer. Then you can manually do whatever you need to with it. CMock and FFF take very different approaches. With CMock, you run it ahead of time on a header files to generate a whole bunch of mock functions for you. There is a lot more "pre-processing machinery" that runs ahead of time. And with CMock, you need to explicitly declare all expected function calls ahead of time. This can lead to tight coupling of tests and code. FFF is much lighter weight. You just include the single header file, and you're ready to go. It works more like a traditional "mock object" you'd see in an object-oriented mocking framework. There is no need to set up all expectations ahead of time -- you just inspect the mock when you're done... and only for the things that you care about. 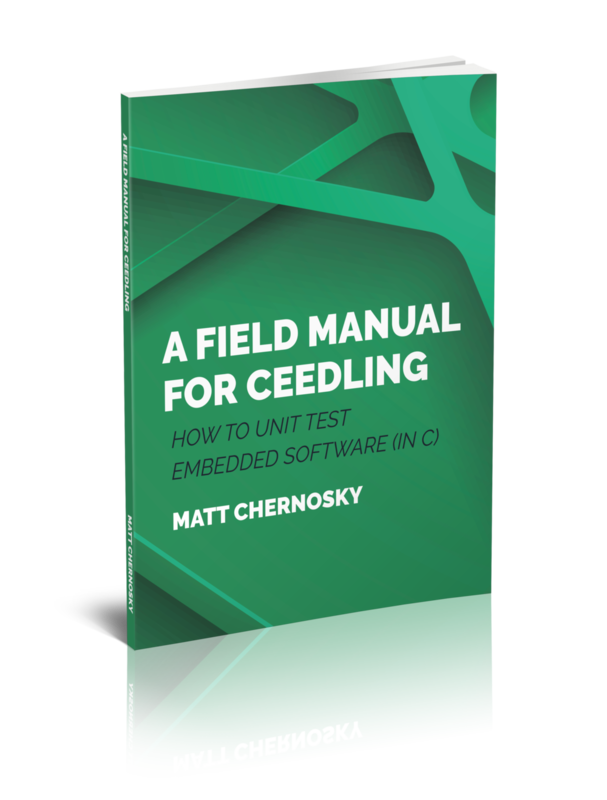 CMock is certainly easy to get started with via Ceedling, which provides automatic discovery, generation and running of tests and mocks. FFF has me excited to work with it further though. In particular, being able to write tests in a more logical given-when-then order, and the ability to ignore mocked calls by default looks to be powerful. With FFF there is a bit more manual work to set up each test, but I think I may be able to write some better quality tests. Get the test project source on GitHub. Save time when using mocks by using Ceedling to automatically generate them for you. See how easy it is in in my downloadable "how to" guide. Sign up to get it here.